Kick-start your healthy eating habits with Formula 1 Healthy Meal Nutritional Shake Mix, a delicious and easy way to treat your body to a nutritious and balanced meal in no time! With a dense mix of protein, carbs, fiber and essential vitamins and minerals, Formula 1 is everything you need in a glass, and with 10 flavors to choose from it's easy to customize for your taste and nutritional needs. Protein is vital to a healthy diet, as it's one of the essential building blocks for many cell components in your body. Protein helps satisfy hunger, build muscle tissue, maintain lean muscle mass and give you energy. Usage: Gently shake the canister prior to each use as contents may settle. Blend or stir 2 scoops (25 g) of Formula 1 with 8 fl. oz. of nonfat milk or soy milk. Create your own Formula 1 recipes by mixing with fresh fruit and ice. Directions for kids: Mix 1 scoop (12.5 g) with 8 fl oz of nonfat milk or soy milk for a nutritious snack. This product is not intended for consumption by kids under 4 years old. Kick-start your healthy eating habits with Formula 1 Healthy Meal Nutritional Shake Mix, a delicious and easy way to treat your body to a nutritious and balanced meal in no time. Not only are these shakes easy to make, they're also delicious, perfect for busy people. Whether you're on the go or just want a nutritious meal, reach for an Herbalife Formula 1 shake to satisfy your hunger and help manage your weight. Usage: Blend or stir 2 scoops (25 g) of Formula 1 with 8 fl. oz. of nonfat milk or soy milk and enjoy!. You can also create your own formula 1 recipes by mixing with fresh fruit and ice. 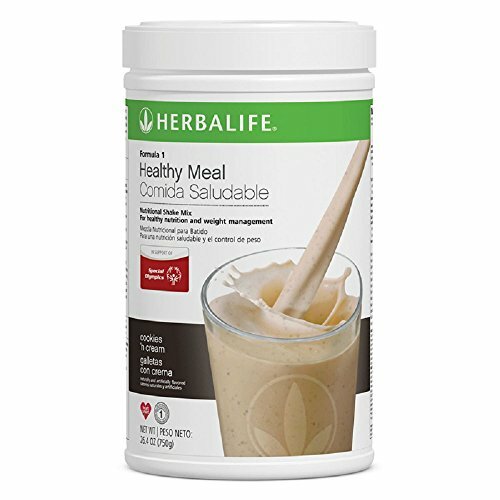 If you have any questions about this product by Herbalife, contact us by completing and submitting the form below. If you are looking for a specif part number, please include it with your message.